Photo for the Mirror by Chuck Meyers Huntingdon’s Alex Mykut delivers a pitch against Hollidaysburg in the Dean Rossi Classic championship game on Saturday at Hollidaysburg Area Senior High School. 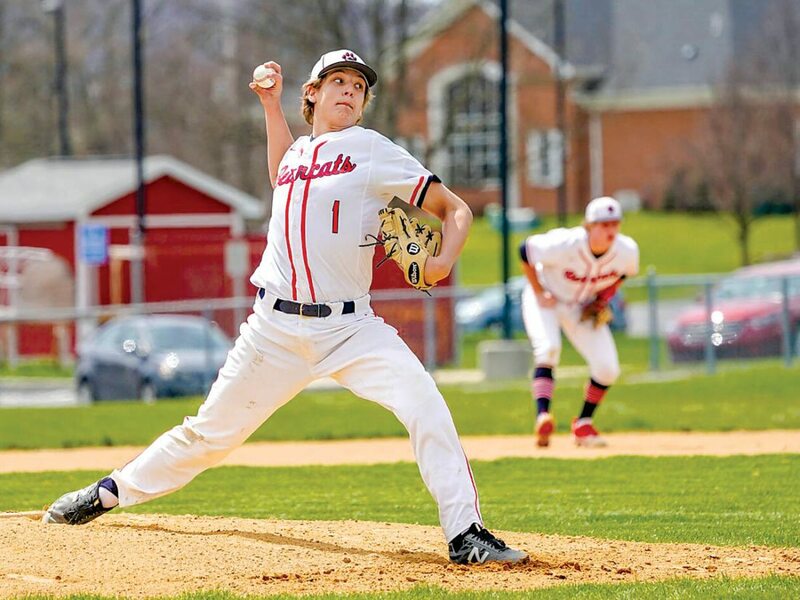 HOLLIDAYSBURG — After reaching the semifinals of the PIAA Class 3A baseball tournament last spring, Huntingdon is off to a 10-0 start this season, and the Bearcats are giving every indication of making a serious run for the state title again. Huntingdon followed up its championship in last weekend’s Curve Classic with another tournament championship in the Dean Rossi Classic Saturday afternoon, defeating host Hollidaysburg, 9-3, in the title game on the Hollidaysburg Area Senior High School field. Senior right-hander Alex Mykut turned in an outstanding starting pitching performance for Huntingdon in the championship game, working 5• innings, striking out 10 batters, walking four, and allowing just two hits and two runs. “Our pitching has carried us all season, and Alex threw very well today, he kept us in the game,” Zanic said. Mykut said that both his fastball and curveball were working well. Huntingdon benefited from five Hollidaysburg errors to score five unearned runs. The Bearcats opened the scoring with two runs in the first inning, capitalizing on two Hollidaysburg errors and getting an RBI double from senior shortstop Nick Holesa. Hollidaysburg drew to within 2-1 in the second inning on a bases-loaded RBI single by junior left fielder Sam Mierley that scored courtesy runner Nicholas Helsel from third base, but Huntingdon broke the game open with a five-run fifth inning that staked the Bearcats to a 7-1 lead. Junior right fielder Jacob Wagner opened the inning with an infield hit, stole second, went to third when the throw to second went into the outfield and scored on senior second baseman Nick Zanic’s infield single. Zanic stole second and third and scored on a Hollidaysburg error to give Huntingdon a 4-1 lead. Designated hitter Jared Showalter — who had reached on the Hollidaysburg error — came in to score on Mykut’s single to left field, giving Huntingdon a 5-1 lead. Senior left fielder Drew Weglarz belted a two-run homer over the fence in left field to score Mykut and cap off the rally, giving Huntingdon its 7-1 cushion. “We won the game with our pitching, speed and defense, and then Weglarz, with the big blast, opened the game up,” George Zanic said. Hollidaysburg coach Jon Szynal, whose team dropped to 3-4, saluted his freshman starting pitcher Caleb Gampe for a solid effort. Gampe allowed just five hits and two earned runs in five innings while striking out five and walking only one. Both teams scored two runs in the sixth inning to set the 9-3 final. Hollidaysburg got an RBI single from sophomore pitcher-infielder Ethan Lieb in the top of the inning, before Huntingdon responded with a run-producing single by senior first baseman Ben Briggs in the bottom of the inning. It was fitting that Huntingdon and Hollidaysburg met up in the championship game of the Dean Rossi Classic, which is held in honor of the late Dean Rossi, who very capably served tenures as an athletic director at both high schools. n Showalter tossed a three-hitter with 10 strikeouts and scored the winning run in the bottom of the seventh inning to help Huntingdon edge Bellefonte in the first round at Longer Elementary field. Weglarz singled in Showalter with two outs in the final inning. Bellefonte went to beat Penn Cambria, 12-1, in the consolation game. n Facing an 0-2 count with two out and the bases loaded in the bottom of the seventh with his team trailing by a run, Collin Stevenson grounded a single inside the third-base bag to score Noah Gochnour and Sam Mierley with the tying and winning runs as Hollidaysburg beat Penn Cambria in the first round. Brenden Hileman pitched the distance for the Tigers, striking out nine and holding Penn Cambria to four hits. Josh Krise went the first 6• innings for Penn Cambria and wound up combining with Richard Perrone on a four-hitter. Mason Ronan drove in Penn Cambria’s run. BELLEFONTE (1): Deitrich ss 300, Fortney cf 211, Funk rf 200, Marsh 1b-p 300, Burd c 101, Lauck 3b 301, Catchmark lf 300, Bossert dh 200, Armstrong p-1b 000, Capparelle 2b 300. Totals — 22-1-3. HUNTINGDON (2): Zanic cf 211, Holesa ss 400, Showalter p 412, Mykut c 201, Briggs 1b 200, Weglarz lf 301, Fisher dh 300, Gearhart 3b 000, J. Ritchey 2b 200, Conner ph 100, R. Ritchey rf 200. Totals — 25-2-5. RBI–Burd, Showalter, Weglarz. WP–Showalter. LP–Marsh. SO–Showalter 10, Armstrong 10, Marsh 2. BB–Showalter 4, Armstrong 5, Marsh 1. Records: Bellefonte (5-2); Huntingdon (9-0). PENN CAMBRIA (1): Cabrera lf 301, Hite cf 211, O’Donnell 2b-3b 000, Buck dh 200, Ronan rf 201, T. Perrone ss 300, R. Perrone 3b-p 300, Shuagis 1b 300, Talko c 301, Hall cr 000, Krise p 300, Reese 2b 000. Totals — 24-1-4. HOLLIDAYSBURG (2): Hileman p 300, Simpson cr 000, Stevenson cf 401, Kratzer 1b 300, Gampe ss 301, Margroum c 200, Helsel cr 000, Nolan 3b 300, Gochnour rf 211, Mierley lf 210, Lieb 2b 301. Totals — 25-2-4. E–Ronan, O’Donnell, Gampe. 2B–Hite. RBI–Ronan, Stevenson. WP–Hileman. LP–Krise. SO–Krise 4, R. Perrone 1, Hileman 9. BB–Krise 4, Hileman 2. Records: Penn Cambria (4-1); Hollidaysburg (3-3). HOLLIDAYSBURG (3): Hileman 3b-2b 400, Stevenson cf 201, Simpson ph 100, Kratzer 1b-3b 300, Heaton ph 100, Gampe p-1b 300, Martin ph 100, Margroum c 100, Helsel cr 020, Nolan ss 300, Gochnour rf 110, Mierley lf 201, Lieb 2b-p 301. Totals — 25-3-3. HUNTINGDON (9): Zanic 2b 422, Holesa ss 311, Troha c 000, Showalter dh 210, Mykut p 311, J. Ritchey p 100, Briggs 1b 401, Weglarz lf 411, R. Ritchey cf 300, Gearhart 3b 210, Wagner rf 322. Totals –29-9-8. E–Nolan, Lieb, Hileman, Margroum, Gochnour, Gearhart, Weglarz. 2B–Holesa. HR–Weglarz. RBI–Mierley, Lieb, Briggs 2, Weglarz 2, Mykut, Holesa, Zanic. SB–Zanic 2, Wagner, Mykut. LOB–Hollidaysburg 7, Huntingdon 6. Hollidaysburg: Gampe (L) 5IP, 5H, 7R, 2ER, 1BB, 5SO; Lieb 1 IP, 2H, 2R, 2ER, 2BB, 1SO. Huntingdon: Mykut (W) 5.1IP, 2H, 2R, 1ER, 4BB, 10SO; J. Ritchey 1.2IP, 1R, OER, 2BB, 5SO. Records: Hollidaysburg (3-4); Huntingdon (10-0). Umpires: Jay Negri (plate); Bill Wolf (bases).